Published: Dec. 17, 2012 at 03:58 a.m.
(11:00) (Shotgun) C.Kaepernick pass deep left to R.Moss for 24 yards, TOUCHDOWN. SF 84-Moss now has 15,219 career rec yards, passing Isaac Bruce for 3rd most all-time. Published: Dec. 16, 2012 at 08:49 p.m.
San Francisco 49ers QB Colin Kaepernick hits WR Randy Moss for a 24-yard touchdown and a 7-0 lead over the New England Patriots in the first quarter. Published: Oct. 30, 2012 at 03:19 a.m.
(7:39) (Shotgun) A.Smith pass short left to R.Moss for 47 yards, TOUCHDOWN. 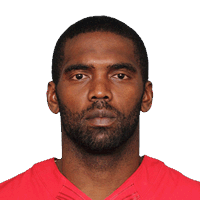 Published: Oct. 29, 2012 at 10:49 p.m.
San Francisco 49ers quarterback Alex Smith finds wide receiver Randy Moss and he breaks out for a 47-yard touchdown.